The article says that BLR is number 5 nationally in terms of international traffic. So I guess that makes Nedumbassery (COK) number 3 or 4. WHat makes Chennai bigger than BLR for international traffic, is it traffic to South East Asia? Traffic to the gulf is what makes MAA and COK have more int'l traffic than BLR which is more business destinations oriented. For MAA, it's more about SE Asia (SIN, KUL, BKK, DPS, KNO) and CMB, and to a secondary extent, the Gulf. COK is almost entirely Gulf traffic. Next airline to face financial trouble: SpiceJet. It has just been downgraded to BB- by CRISIL. Apparently the airline has sought extension for payment of leases. By the looks of it, India will be down to 3-4 big airlines with Indigo being bigger than everyone combined. With the number of NEOs on order, Indigo is basically driving everyone out of the market. Once Pratt's engine issues are sorted and they introduce the promised PIPs in probably 3 years time, they will literally kill competition one by one (God knows how many will even make until then at the current rate). Not the best case for a consumer, I wish others get their acts together, we need competition especially when the market is growing at 15-20% annually. Last edited by sibibom on Wed Oct 10, 2018 5:27 am, edited 1 time in total. Jet has grounded 2 WB at MAA..
By the looks of it, India will be down to 3-4 big airlines with Indigo being bigger than everyone combined. With the number of NEOs on order, Indigo is basically driving everyone out of the market. IndiGo will cross 50% domestic market share in 12-18 months even if none of the others cease to operate. After months of uncertainty Air Asia India finally has a CEO - Sunil Bhaskaran, a Tata Steel veteran. Let us see how long he lasts. Another engine failure for IndiGo: VT-IVB suffered a mid air engine failure on 08OCT18. The aircraft has been grounded. IndiGo launches 1x daily on Ahmedabad - Dubai wef 29OCT18. Kochi - Dubai reduces to 1x daily from 2x daily on the same day. India has once again rejected Dubai's demand for additional seats and new points of call. 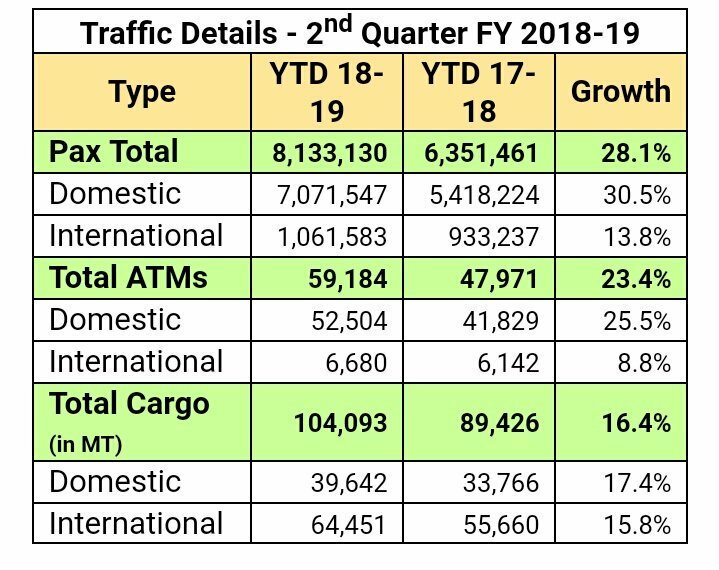 This government has been extremely protectionist with bilateral rights and that reflects in the anaemic international passenger growth despite the breakneck pace of domestic passenger growth. One of the reasons for rejecting the additional seats has been the refusal of DXB operator to grant prime peak hour slots to Indian carriers. Interesting too is that there were only 176 passengers on this flight. What does it mean that AI can't even get decent loads on the JFK flight? It will be better not to draw conclusions based on the math of Indian media. During the last incident at JFK in 11th Sept , the flight was full (as reported by media) and just after a month, the flight is half empty!! AI is getting good loads at JFK /EWR and the JFK BOM is happening. Just the starting date hasn't been officially announced yet. I guess it to be November end or second week of December. Which is fair enough, Indian carriers get dead of the night 2-4am slots, while Emirates can use better-timed slots to get maximum advantage. Or they could just dismantle D company network and hand over criminal and economic fugitives, the Indian government will happily oblige then, the ball is in Dubai's court. Go Air had its inaugural international flight DEL-HKT this morning. While trying to reconcile the schedules I just discovered that they have an aircraft idling at HKT the entire day on Thursdays. Not a great plan - especially when their main competitor is trying to squeeze every minute of flying time form their aircraft. Seems like IndiGo keeps on adding new flights and destinations every day. I am curious, where is all this demand coming from? I know there is growing demand for air travel but it's not like they are the only one out there. Are they maybe expanding a bit too fast? They'll get one new neo every week for the next 8 years. They have to fly them somewhere! Jet Airways launches Pune-Singapore wef 01DEC18 and increases frequency on Delhi-Singapore to 3x daily from the same day. For Pune airport this will be the first east bound international service. I understand that but what I am wondering if all this expansion will be profitable for them. I guess we will know in a year or two. Whether they will be profitable or not, they would only probably know themselves by their own forecasts with that rate of expansion. Im sure they've done their homework on that. They have one serious owner who has immense aviation experience. They also have a very stable and well put together top management. Aside from that, like stated earlier, they have to keep their newly inducted fleet up in the air on whatever routes they can . Its also like an agenda for them to grab all the important slots at the major airports before they run out, of which they already have in plenty at all airports that too many prime slots, and to also weaken their competitors by chasing and dumping on their routes. Their strategy is no different than AirAsia or Lion Air in their respective home markets. Presume they must got a very good deal. With so much sales coming online (makemytrip) though, less need for traditional agents. An IX/AXB 737 while taking off from TRZ/Trichy took out a localiser and part of a periphery wall mesh. With the pilots presumably unaware of what happened, the flight carried onwards to BOM and the damaged underbelly and part of boundary wall mesh stuck within one of the main landing gear was discovered only upon landing at BOM. What mehn! Who cares about these figures? Surat is the new Mumbai. All dhando is shifting from Mumbai to Surat wonly! A non-stop STV-EWR flight cannot come soon enough! STV-EWR? NO! STV-AMS/JFK/YYZ/LHR minimum or else they will do HARTAL wearing white tshirts in middle of the city making a mockery of themselves (Like they always do anyways) with 0 results. 3) Handled its highest ever ATM of 692 on 31/08. Not sure if that last statement is supportive of the 31 MPPA expectation or not. From October 28 Ethiopian will reduce ADD-DEL from previously filed 14 weekly to 10, flight is operated by the B767. I can't imagine this 767 being a great ride compared to their B787. ADD-BOM stays as two daily, operated by the B777. How come there are so many more frequencies and seats to BOM than to DEL? Because the African market from Mumbai is much greater than from Delhi. Note that JNB BOM is the market with highest traffic out of all Africa India routes but lacks a non stop. ET gets a good amount of that traffic too . Thus the capacity difference. Thank you, what's fuelling all this growth from BOM to Africa? Are there a lot of Africans living there? How come no one launched JNB-BOM? Anyone know how big the market is? I don't know exactly what's fuelling the growth . Maybe related to the diamond industry , Indian diaspora in that continent , migrant workers . About JNB-BOM , roughly a decade ago there were twice daily non stops (SAA and 9W) and an AI's BOM-DUR-JNB-BOM (3 weekly) in this sector but now none!! It's demand is filled with ME3 , ET ,KQ . However recently there were route announcements like DAR-BOM, LOS-BOM which are much smaller markets . So I won't rule out a JNB/CPT- BOM in the near future . Thanks for sharing that - one of the guys in that video is a friend I've flown GA with, an excellent pilot. Indians have been trading with E Africa even before Vasco de Gama arrived from ports like Surat, Porbandar and such. The incumbent Indian carriers were rather busy serving only class F and J passengers. Kenya Airways and Southafrican Air are similarly mismanaged. This traffic has been picked up by Ethiopian and ME3. Obviously Sir Gangwal knows how Southwest cleaned up the inefficient American carriers. As CEO of Air France he had the ringside view of what EZ Jet and Ryan Air did. He is competing with upper class Indian Railways tix plus hotel cost. He just has to beat that #. The days when Dubai was the chosen getaway for criminal and economic fugitives is long over just like Switzerland is no longer the tax haven of choice. To their credit, Dubai has majorly cleaned up its record in the past 2 decades. The chosen refuge for criminal & economic fugitives from India these days is Africa with Uganda being top of the list along with island republics like Antigua. Getting back to Emirates, further expansion of bilaterals should be done conditional to Indian carriers getting day time slots. For too long Emirates & ME3 have bribed their way through every bilateral negotiation. That has to stop. In other news notorious wikipedia editor Jetstreamer has ravaged several Wiki articles related to Indian aviation. Keep the posts civil, on topic, and free of cuss words. Due to the dynamics of the Indian market these discussions can get lively. But leave political accusations for non-aviation. The only politics that belong are bilaterals. For example, it was noted any expansion of Dubai bilaterals should have slots for Indian airlines at preferred flying times. That is on topic. Do not discuss other users other than to quote what they stated. It's telling if 4 77W's are grounded currently.